In survival situations, everything is a potential tool for bettering your situation. U.S. paratroopers found this to be true during the second world war. Once on the ground, soldiers harvested the suspension lines from their parachutes and used them for general purpose cordage. It was so useful, that the military has since made paracord readily available to most every unit. It’s also commonly available to civilians as well. Paracord comes in a variety of types; the most common is Type III also known as 550 cord. As the name implies, 550 cord has a tensile strength of 550 pounds. That’s pretty impressive for such a small and flexible line. Paracord is lightweight and easily carried in survival kits. In fact, it can be fashioned into bracelets, lanyards, or handles and carried on your person or gear. There are a wide range of uses for paracord for the prepper/survivor. Let’s consider a few of them. When lost or awaiting rescue, it’s generally sound advice to stay where you are. Wandering around only makes the emergency personnel’s task that much more difficult. However, staying put doesn’t mean you’ll be sitting around all day. Instead you will be effecting survival by collecting firewood, purifying water, and searching for food and shelter. Remaining ambulatory is a must in survival situations. So taking care of your feet is important. A broken shoestring makes getting around much more difficult if not dangerous. Having some paracord available as an improvised shoestring can prevent a twisted ankle or worse. Surviving in the wild doesn’t necessarily mean you have to do with out some of the creature comforts that make life a bit easier. With some paracord, a few straight sticks, and a little knot tying knowledge, you can make your time in the wilderness a bit more pleasant. Using a few simple lashings, you can build a table to eat on or a shelter to sleep under. You can create a tripod for suspending food or water above your fire or a clothes line to dry your clothes. You’re only limited by your own ingenuity. Collecting wild edibles is a good way to give your body some of the essential nutrients it needs. 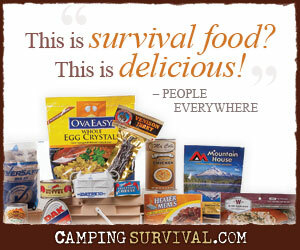 But during a survival situation, you’re burning a lot of calories. Wild edibles alone won’t give you the energy you’ll need. That’s where paracord can help you to gather some additional food. One of the things that gives paracord its strength is its composition. Inside the smooth outer sheath are many smaller strands of threads. You can deconstruct the paracord and remove the inner fibers for use as fishing line. Hopefully your everyday carry kit (EDC) contains fish hooks. If not, you’ll have to improvise with a small stick, thorn, safety pin, or some other material. Anyone who has been fishing knows that a hook in the water is no guarantee of hauling in a keeper. This is especially true when some of your tackle is makeshift. With a little know how, you can use a length of paracord to create a few snares and dead falls that will hopefully catch a rabbit, squirrel, or even a mouse to eat. The nice thing about snares and dead falls is that they are force multipliers. They work while you are doing other things or are sleeping. The more you put out, the better your odds of putting some meat on your skewer. When thrust into a stressful situation like that of a survival scenario, many people panic or get careless. In normal times this can be an annoyance that requires a trip to the Emergency Room. In the wilderness, it can mean death. Without the safety net of modern medicine readily available, the survivor must be very careful to avoid injury. Still, accidents happen. Once again, paracord can be useful. The inner threads can be extracted and used as an impromptu suture to close a cut. Or the cord itself can be used to secure a splint to immobilize a broken bone or sprained joint. Recreational campers know that the ground can draw the heat from you at night, leaving you shivering and praying for morning. Insulating yourself from the earth is important. A collection of evergreen boughs, a thick layer of grasses, or some other material can be used to put a protective layer between you and the heat-sapping earth. Simply piling a bunch beneath you will work, however weaving a nice pallet will help keep the bedding in place. And as an added bonus, it’ll hold it together when transporting to a new, more favorable campsite. These are but a few of the many uses of paracord. There’s no limit to the usefulness of the cordage in a survival situation. It’s light-weight, strong, divisible, and should be a part of every kit. But as with every survival device, it’s only as useful as your knowledge and skill in putting it to use. Learn to tie a variety of knots, practice making a few campsite gadgets, and go fishing once in a while. Learn to use this tool of many uses. on 21 spot, you should build quality backlinks , it will help you to get more visitors.